A modern depiction of a molecule of benzene, the prototypical aromatic compound. The hexagon is formed by six carbon atoms, each of which has a hydrogen atom attached to it. This is usually considered to be because electrons are free to cycle around circular arrangements of atoms, which are alternately single- and double-bonded to one another. These bonds may be seen as a hybrid of a single bond and a double bond, each bond in the ring identical to every other. This commonly-seen model of aromatic rings, namely the idea that benzene was formed from a six-membered carbon ring with alternating single and double bonds (cyclohexatriene), was developed by Friedrich August Kekulé von Stradonitz. The model for benzene consists of two resonance forms, which corresponds to the double and single bonds' switching positions. Benzene is a more stable molecule than would be expected without accounting for charge delocalization. Many of the earliest-known examples of aromatic compounds, such as benzene and toluene, have distinctive pleasant smells. This property led to the term "aromatic" for this class of compounds, and hence to "aromaticity" being the eventually discovered electronic property of them. The key aromatic hydrocarbons of commercial interest are benzene, toluene, ortho-xylene, and para-xylene. About 35 million tonnes are produced worldwide every year. They are extracted from complex mixtures obtained by the refining of oil or by distillation of coal tar, and are used to produce a range of important chemicals and polymers, including styrene, phenol, aniline, polyester, and nylon. A molecule of benzene shown in the form of two resonance structures. In the image on the right, a molecule of benzene is shown in the form of two hypothetical resonance structures. Neither structure is an adequate representation of the actual compound, and the double-headed arrow indicates that the molecule is best represented by a hybrid (average) of these two structures. 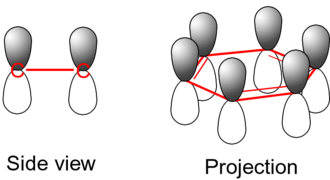 Generally, a double covalent bond (as in C=C) is shorter than a single covalent bond (as in C−C). In the case of benzene, however, all six carbon-carbon bonds have the same length, intermediate between that of a single bond and a double bond. Thus, the six carbon atoms in the benzene molecule form a perfect hexagon. 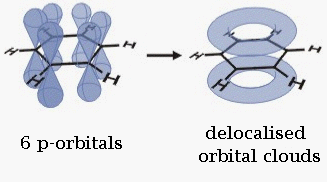 Since they are out of the plane of the atoms, these orbitals can interact with each other freely, and become delocalized. This means that instead of being tied to one atom of carbon, each electron is shared by all six in the ring. Thus, there are not enough electrons to form double bonds on all the carbon atoms, but the "extra" electrons strengthen all of the bonds on the ring equally. The resulting molecular orbital has π symmetry. The first known use of the word "aromatic" as a chemical term—namely, to apply to compounds that contain the phenyl radical—occurs in an article by August Wilhelm Hofmann in 1855. If this is indeed the earliest introduction of the term, it is curious that Hofmann says nothing about why he introduced an adjective indicating olfactory character to apply to a group of chemical substances, only some of which have notable aromas. Ironically, many of the most odoriferous organic substances known are terpenes, which are not aromatic in the chemical sense. But terpenes and benzenoid substances do have a chemical characteristic in common, namely higher unsaturation indexes than many aliphatic compounds, and Hofmann may not have been making a distinction between the two categories. The cyclohexatriene structure for benzene was first proposed by August Kekulé in 1865. Over the next few decades, most chemists readily accepted this structure, since it accounted for most of the known isomeric relationships of aromatic chemistry. However, it was always puzzling that this purportedly highly unsaturated molecule was so unreactive toward addition reactions. The discoverer of the electron J.J. Thomson, in 1921, placed three equivalent electrons between each carbon atom in benzene. In fact, this concept can be traced further back, via Ernest Crocker in 1922, to Henry Edward Armstrong, who in 1890, in an article entitled The structure of cycloid hydrocarbons, wrote, "the (six) centric affinities act within a cycle…benzene may be represented by a double ring (sic) … and when an additive compound is formed, the inner cycle of affinity suffers disruption, the contiguous carbon-atoms to which nothing has been attached of necessity acquire the ethylenic condition. Here, Armstrong is describing at least four modern concepts. Firstly, his "affinity" is better known nowadays as the electron, which was only to be discovered seven years later by J. J. Thomson. Secondly, he is describing electrophilic aromatic substitution, proceeding (thirdly) through a Wheland intermediate, in which (fourthly) the conjugation of the ring is broken. He introduced the symbol C centered on the ring as a shorthand for the inner cycle, thus anticipating Eric Clar's notation. Arguably, he also anticipated the nature of wave mechanics, since he recognized that his affinities had direction, not merely being point particles, and collectively having a distribution that could be altered by introducing substituents onto the benzene ring (much as the distribution of the electric charge in a body is altered by bringing it near to another body). The quantum mechanical origins of this stability, or aromaticity, were first modeled by Hückel in 1931. He was the first to separate the bonding electrons in sigma and pi electrons. Whereas benzene is aromatic (6 electrons, from 3 double bonds), cyclobutadiene is not, since the number of π delocalized electrons is 4, which of course is a multiple of 4. The cyclobutadienide (2−) ion, however, is aromatic (6 electrons). An atom in an aromatic system can have other electrons that are not part of the system, and are therefore ignored for the 4n + 2 rule. In furan, the oxygen atom is sp2 hybridized. One lone pair is in the π system and the other in the plane of the ring (analogous to C-H bond on the other positions). There are 6 π electrons, so furan is aromatic. Aromatic molecules typically display enhanced chemical stability, compared to similar non-aromatic molecules. The circulating π electrons in an aromatic molecule produce ring currents that oppose the applied magnetic field in NMR. The NMR signal of protons in the plane of an aromatic ring are shifted substantially further down-field than those on non-aromatic sp2 carbons. This is an important way of detecting aromaticity. By the same mechanism, the signals of protons located near the ring axis are shifted up-field. Planar monocyclic molecules containing 4n π electrons are called antiaromatic and are, in general, destabilized. Molecules that could be antiaromatic will tend to alter their electronic or conformational structure to avoid this situation, thereby becoming non-aromatic. For example, cyclooctatetraene (COT) distorts itself out of planarity, breaking π overlap between adjacent double bonds. Benzene, toluene, and the family of xylenes are simple aromatic hydrocarbons, with each molecule possessing a six-membered ring of carbon atoms. Over time, various additional types of aromatic compounds have been identified, as follows. In heterocyclic aromatics, one or more of the atoms in the aromatic ring is of an element other than carbon. This can lessen the ring's aromaticity, and thus (as in the case of furan) increase its reactivity. Other examples include pyridine, imidazole, pyrazole, oxazole, thiophene, and their benzannulated analogs (benzimidazole, for example). Naphthalene is an example of a polycyclic aromatic compound. Each hexagonal ring is made up of carbon atoms, and the two rings share two carbon atoms. Polycyclic aromatic hydrocarbons (PAH) are molecules containing two or more simple aromatic rings fused together by sharing two neighboring carbon atoms (see also simple aromatic rings). Examples are naphthalene, anthracene, and phenanthrene. Many chemical compounds contain simple aromatic rings in their structure. Examples are DNA which contains purine and pyrimidine, trinitrotoluene (TNT), acetylsalicylic acid (aspirin), and paracetamol. A special case of aromaticity is found in homoaromaticity where conjugation is interrupted by a single sp3 hybridized carbon atom. When carbon in benzene is replaced by other elements in borabenzene, silabenzene, germanabenzene, stannabenzene, phosphorine or pyrylium salts the aromaticity is still retained. Aromaticity is also not limited to compounds of carbon, oxygen, and nitrogen. Metal aromaticity is believed to exist in certain metal clusters of aluminum. Möbius aromaticity occurs when a cyclic system of molecular orbitals formed from pπ atomic orbitals and populated in a closed shell by 4n (n is an integer) electrons is given a single half-twist to correspond to a Möbius topology. Because the twist can be left-handed or right-handed, the resulting Möbius aromatics are dissymmetric or chiral. Up to now there is no doubtless proof, that a Möbius aromatic molecule was synthesized. Aromatics with two half-twists corresponding to the paradromic topologies first suggested by Johann Listing have been proposed by Rzepa in 2005. In carbo-benzene the ring bonds are extended with alkyne and allene groups. ↑ P. v. R. Schleyer, "Aromaticity (Editorial)," Chemical Reviews, 2001, 101: 1115-1118. ISSN 0009-2665. ↑ A. W. Hofmann, "On Insolinic Acid," Proceedings of the Royal Society, 8 (1855): 1-3. ISSN 0080-4649. ↑ James Wilson Armit and Robert Robinson, CCXI.—Polynuclear heterocyclic aromatic types. Part II. Some anhydronium bases, Journal of the Chemical Society 127 (1925): 1604-1618. ISSN 0368-1769. ↑ Ernest C. Crocker, Application of the Octet Theory to Single-Ring Aromatic Compounds. J. Am. Chem. Soc. 44(8): 1618-1630. ISSN 0002-7863. ↑ Henry Edward Armstrong, The structure of cycloid hydrocarbons, Proceedings of the Chemical Society (London), 6 (1890): 95-106. ↑ D. Ajami, O. Oeckler, A. Simon, R. Herges, Letters to Nature: Synthesis of a Möbius aromatic hydrocarbon 426 (2003): 819. ISSN 0028-0836. ↑ Henry S. Rzepa A Double-Twist Möbius-Aromatic Conformation of Annulene Org. Lett. 7(21): 4637. ISSN 1523-7060.
International Symposium on Polynuclear Aromatic Hydrocarbons, Philippe Garrigues, and Michel Lamotte. 1993. Polycyclic Aromatic Compounds: Synthesis, Properties, Analytical Measurements, Occurrence, and Biological Effects: Proceedings of the 13th International Symposium on Polynuclear Aromatic Hydrocarbons, October 1-4, 1991, Bordeaux. Yverdon, Switzerland: Gordon and Breach Science. ISBN 0841210144. Morrison, Robert T., and Robert N. Boyd. 1992. Organic Chemistry, 6th edition. Englewood Cliffs, NJ: Prentice Hall. ISBN 0-13-643669-2. This page was last modified on 10 September 2008, at 13:00.